Low back pain can erode the quality of one’s life, spiritual and physical wellbeing. At the Centeno-Schultz Clinic we acknowledge that there many sources of low back pain which include muscle dysfunction, ligament laxity, lumbar degenerative disc disease (DDD) and lumbar facet injury. 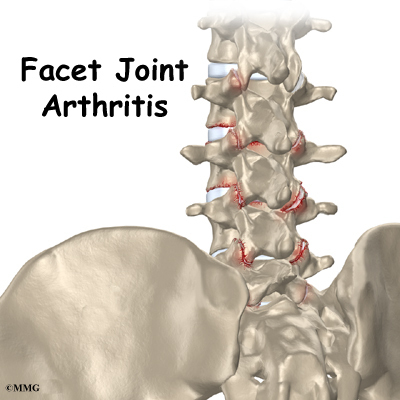 The facet joint is located in the posterior aspect of the spine. It is lined with cartilage and allows for smooth non painful motion of the back. Injury to the joint and cartilage results in pain. Treatment options start with an accurate diagnosis. At the Centeno-Schultz clinic we perform both diagnostic injections to confirm the diagnosis of lumbar facet injury and well as definite therapy in the form of radiofrequency. FZ is 55y/o athletic patient with 25 year history of low back pain which was constant in duration, 6/10 in severity, progressive in nature without radiations. He had undergone conservative therapy in the form of PT, message, chiropractic care and trial of NSAID and muscle relaxants. Physical examination was significant for back pain on extension and lateral rotation. Patient underwent x-ray guided injection of local anesthetic into the joint(intra-articular joint injection) which completely eliminated his pain for several days. He subsequently had the nerves which provide sensation to the lumbar facet joint burned (radiofrequency). 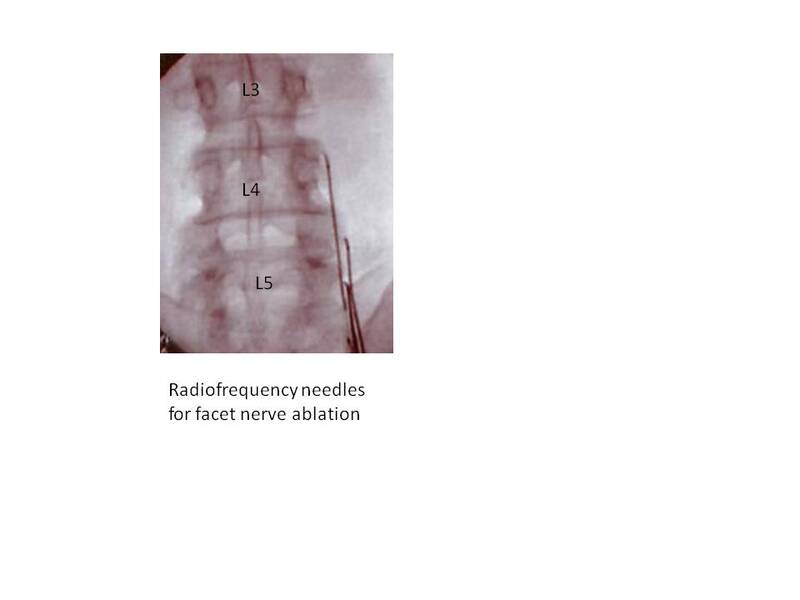 Below are the x-ray pictures of the radiofrequency needles. Thermal energy is conducted to the end of the needle which cauterised the targeted nerve thereby stopping the pain signal arising the joint from traveling to the brain. FZ returned to clinic today and reports 80% improvement in his low back pain which has enabled him to get back on the ice and follow his passion. Buttock pain can be disabling and may arise from many different sources. Lumbar degenerative disc disease, lumbar facet dysfunction, lumbar disc herniation, piriformis syndrome, inflammation of the buttock and hip tendons can all lead to buttock pain. Diagnostic ultrasound examinations at the Centeno-Schultz Clinic can demonstrate muscle tears as well as inflammation of the tendons. 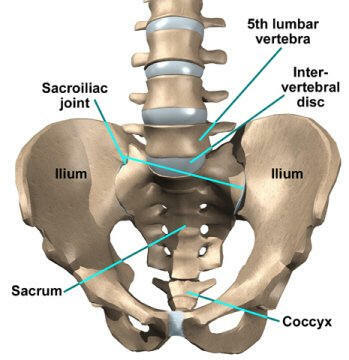 The sacrolillac joint ( SI) and its supporting ligaments can be associated with debilitating buttock pain. Clinical presentation varies as illustrated in pain diagram below. 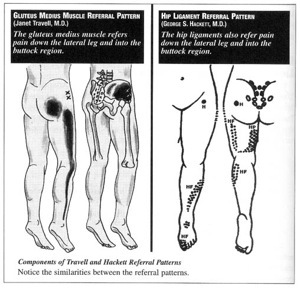 Patients may have pain in the buttock, posterior thigh, lower back, groin, hip and calf. NB is 34y/o patient with 5 year history of buttock and groin pain which was progressive in nature and constant in duration and prevented her from walking, running or playing with her children. Therapies to date had included exploratory surgery, consults with GYN, urologist and neurologist, PT and oral medications. 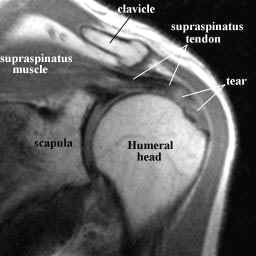 At the Centeno-Schultz clinic patient underwent prolotherapy of the SI joint and the supporting ligaments. Successful outcome is dependent x-ray guided placement of proliferate solution into the joint as well as the supporting ligaments. A recent article underscored the importance of the treating the iliolumbar ligament as it is essential to the stability of the SI joint. This the quality of care one can expect at Centeno-Schultz Clinic. 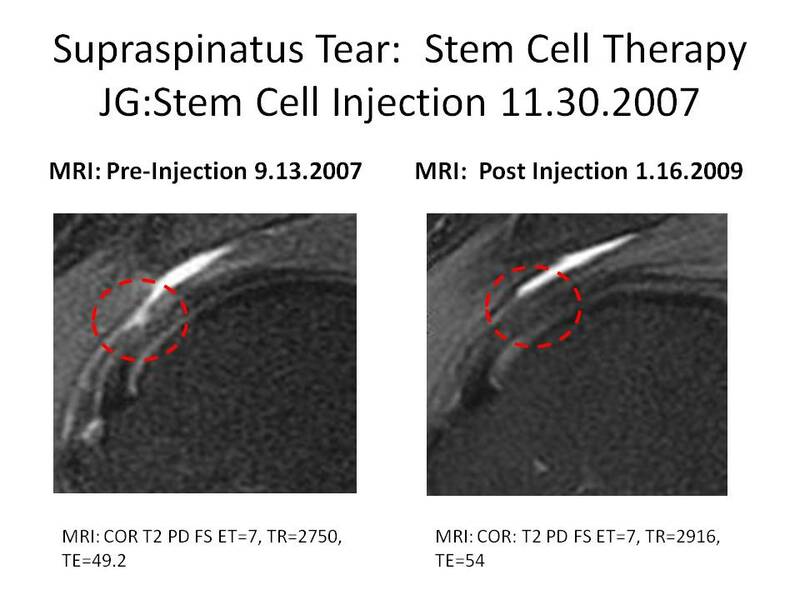 Stem cells utilizing the Regenexx procedure have also provided patients with SI joint pain significant relief. NB returned to clinic recently and reported 80% improvement in her symptoms. Platelet rich plasma (PRP) therapy has gained increasing attention as a non surgical option for musculoskeletal injuries. Platelets are rich in growth factors which mobilize repair cells, promote cell division and accelerate healing. At the Centeno-Schultz Clinic PRP has been successful in treatment of elbow, hip, knee and heel pain( lateral and medial epicondylitis, piriformis syndrome, patellar tendinopathy and Achilles tendinopathy. Maximal clinical results are obtained when an accurate diagnosis is established, injection of PRP is performed under ultrasound guidance and a labatory prepated PRP is utilized. Identifying the source of pain is essential. Delivery of the platelet concentrate must be directly into the area of damage. 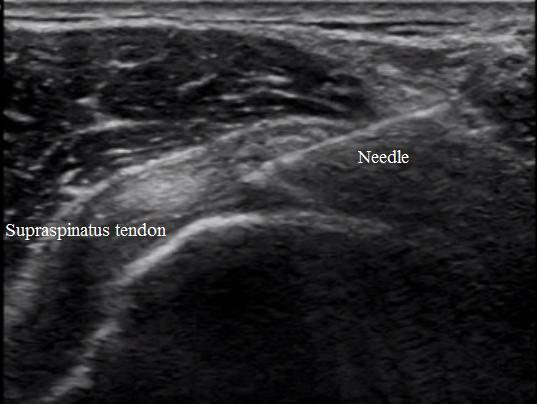 Ultrasound gives direct visualization of the damaged tissue and the where the injected platelets are going. At the Centeno-Schultz Clinic we have a state of the art laboratory which enables us to prepare a customized platelet concentrate which has a higher number of platelets and less cellular debris than bedside centrifuge units commonly employed by most clinics.